This review will take a look at general information about Bostitch Heavy Duty Stapler to guide you through its specifications. You’ll find out details on its pros and cons and learn what the customers think about it. In this way, you can get an in-depth overview of a reliable tool. The Bostitch heavy duty stapler is likely to appeal to a broad array of different users, from professional builders all the way up to amateurs. It is designed to be simple-to-use and sturdy enough for most project types. Read on to see if this choice suits your needs. 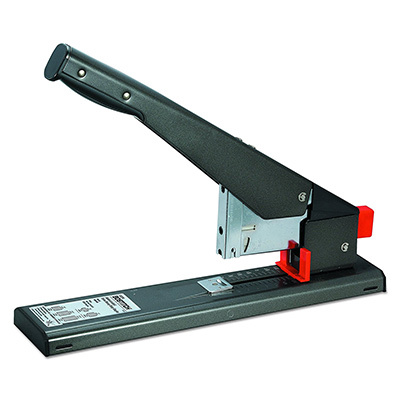 The Bostitch heavy duty stapler is designed to handle a broad variety of different stapling needs. For example, it can go through jobs as small as two sheets all the way up to 215. That’s because it integrates a no-jam system that works to keep your staples flowing easily through your machine. If there are any issues with jamming, the quick-eject button can throw these problematic staples out of the gun quickly and easily. The exterior design consists of an all-metal construction that is protected by a seven-year limited warranty. This surface has been treated with an antimicrobial solution to keep it from impacting your health. People who are interested in stapling a multitude of projects are likely to enjoy this product. For example, it can be used to staple together books and other projects. However, it is strong enough to work with a variety of furniture upkeep projects and detailing as well. Before purchasing a Bostitch heavy duty stapler, it is important to take a look at a few of its specifications. These are the most important for you to consider if you plan on buying this product or any others like it. There are many pros and cons of this model that must be fully understood before you make a purchase. Thankfully, the advantages do outweigh the disadvantages of this product. However, the cons do showcase a few issues that could make it more difficult to use correctly. The following are the most common examples of positives and negatives we could find in each category. They have been carefully checked and researched to ensure they are accurate. Later on, we will discuss what customers are saying about this product. For now, let’s see what this tool can do and what jobs are out of its reach. A somewhat flimsy feel when using it. Jams more frequent when buying non-Bostitch staples. Surprising ejection of the staple drawer when in use. Most reviewers who brought up these issues with this product stated that they were still happy with it. On top of that, several even pointed out that it was very easy to clean out the jams (by far the most common complaint) without much effort. In fact, praise was particularly high when discussing the price. Many users found that it was an affordable stapler that worked surprisingly well on some particularly challenging jobs. Generally, we think that this product is a pretty good choice for people who need a day-to-day stapler that won’t wear down. Therefore, if you think that the Bostitch heavy duty stapler is the right product for you, let us know in the comments below. You can also comment if you think we missed out on any relevant points while discussing its design. Your input can provide additional details for this overview and point other readers in the right direction.